Home › Bidding wars › Homebuying 101: Do seminars expose conflicts of interest, implications of speculative cycles? In the documentary, Inequality for All, former Secretary of Labor / public policy professor Robert Reich uses an animated graphic (not the cartoon above) to describe the chain reactions and interrelationships that fuel economic cycles, both virtuous and vicious. 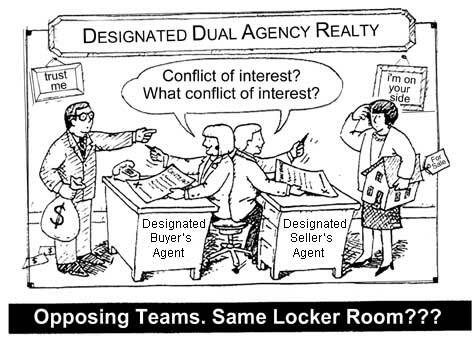 Do homebuyers need similar diagrams or parodies to expose the “speculative cycle” that is likely to peak this year, and the role of conflicts of interest in real estate? YES, particularly right now, before sensationalized media coverage of bidding wars reignites another season of irrational exuberance. Last week, Nobel-prize winning economist, Robert Shiller told CBNC that 2014 is beginning to look like 2005 or 2006, when housing prices rose too far, too fast. 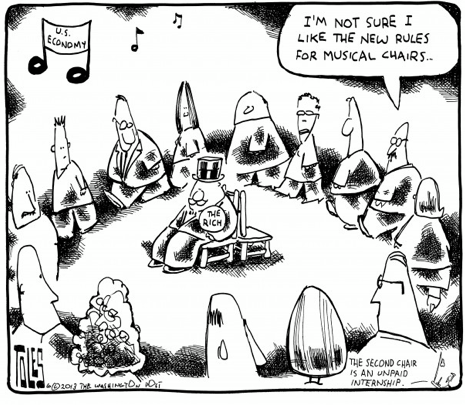 SENSATIONALIZE OR REGULATE BIDDING WARS? Over the next four months, Harvard University Housing and Harvard University Employees Credit Union will offer approximately two dozen home buying seminars across their various campuses and professional schools. Some will be delivered by Harvard staff, others are co-taught by their real estate partner, Coldwell Banker. One year ago tomorrow, Harvard Alumni Association co-sponsored a home buying seminar online for alumni. Do Harvard and their real estate partner CBRB have an obligation to disclose agency options accurately, and describe ways to opt out of conflicts of interest inherent in Designated Agency? If Harvard receives a fee for referring faculty, students or alumni to CBRB, what implications does that have for content and advice provided in their educational seminars? If sales occur in-house at CBRB that are well over asking price as they did in Cambridge during 4Q2013, does informed consent require that those stats be disclosed to Harvard faculty, employees, alumni and others before they give up their right to representation without conflict of interest? FRIENDLY CRITIQUE OR PUBLIC DEBATE? Last year, working together with Consumer Advocates in American Real Estate (CAARE.org), we offered Harvard Faculty and Employees Real Estate Services a friendly critique of their / CBRB’s educational content and slides regarding Designated Agency. Unfortunately, that offer was declined. So far this year, we have not disclosed details of our Bidding War Scorecard to the public; instead we extended an invitation to share it with the Harvard Alumni Association. On the eve of the next home buying seminar, the offer still stands. Should Real Estate Cafe host our own defensive home buying course entitled, What they don’t teach you in Homebuying 101? If we do, let us know whether you prefer to join us online or in person?